America is in fiscal peril in the short run because of a 10-year spending binge by Bush and Obama and in the long run because of a toxic combination of entitlement programs and demographics. Congressman Paul Ryan has introduced a budget plan to address America’s fiscal crisis, but Senator Reid and President Obama have summarily rejected his proposal, so it appears the United States will continue to drift in the wrong direction. Something is needed to compel action. One might think that such an impetus would have been provided by the recent decision by Standard & Poor to downgrade the fiscal outlook for the United States. But this development hasn’t affected the spending culture in Washington. But there is hope. Senator Corker has legislation that would force Congress to act – and automatically impose fiscal discipline if they don’t. His bill caps – and then slowly reduces – government spending as a share of national economic output (gross domestic product). I’ve already written about the merits of this proposal, including an explanation of the all-important enforcement mechanism of sequestration (automatic spending cuts). Here’s Senator Corker’s description of his plan, as delivered at a Cato Institute conference on the Economic Impact of Government Spending. To build on the Senator’s comments, there are two things that deserve special emphasis. 1. He correctly understands that the problem is the size of government. As explained in this video, spending is the problem and deficits are a symptom of that problem. Unfortunately, many policy makers focus on the budget deficit, which often makes them susceptible to misguided policies such as higher taxes. At best, such an approach merely substitutes one bad way of financing federal spending with another bad way of financing federal spending. And it’s much more likely that higher taxes will simply lead to more spending, thus exacerbating the real problem. 2. Senator Corker’s legislation has a real enforcement mechanism. If Congress fails to produce a budget that meets the annual spending cap, there is a “sequester” provision that automatically takes a slice out of almost every federal program. Modeled after a similar provision in the successful Gramm-Rudman-Hollings law of the 1980s, this sequester puts real teeth in the CAP Act and ensures that the burden of government spending actually would be reduced. Some people complain that Senator Corker’s plan is too timid and that it doesn’t balance the budget by 2021. While it would be desirable to impose additional fiscal restraint, the Tennessee Senator has deliberately chosen a more modest goal in order to attract support from colleagues on the other side of the aisle. And he does have Democratic co-sponsors, something that is critical given the composition of the Senate. Since I’m just a policy wonk, I’ll leave it to the other people to argue about what’s feasible in the current political environment. My final comment, though, is that we’re on an unsustainable path that will lead to the end of American exceptionalism and turn the United States into a decrepit, European-style welfare state. So I’m not going to complain if someone has a plan that finally moves policy in the right direction, albeit not quite as fast as I prefer. The recent agreement between Obama and Boehner supposedly cuts spending by $38 billion. I’ve already explained that this number is disappointingly small and noted that the effect on spending for the current fiscal year is almost too small to measure. But my analysis was entirely too kind. My Cato Institute colleagues have put together a clever one-minute video mocking both Obama and Boehner for using the dishonest Washington definition of a spending cut – meaning they claim spending cuts merely because they increase the budget by less than previously planned. Why Are Geithner and Bernanke Trying to Panic Financial Markets with Debt Limit Demagoguery? By taking advantage of “must-pass” pieces of legislation, Republicans have three chances this year to restrain the burden of government. They didn’t do very well with the ‘CR fight” over appropriated spending for the rest of FY2011, which was their first opportunity. I was hoping for an extra-base hit off the fence, but the GOP was afraid of a government shutdown and negotiated from a position of weakness. As such, the best interpretation is that they eked out an infield single. The next chance to impose fiscal discipline will be the debt limit. Currently, the federal government “only” has the authority to borrow $14.3 trillion (including bookkeeping entries such as the IOUs in the Social Security Trust Fund). This is a very big number, but America’s gross federal debt will hit that limit soon, perhaps May or June. Republicans say they will not raise the debt limit unless such legislation is accompanied by meaningful fiscal reforms. The political strategists in the Obama White House understandably want to blunt any GOP effort, so they are claiming that any delay in passing a “clean debt limit” will have catastrophic consequences. Specifically, they are using Treasury Secretary Tim Geithner and Federal Reserve Bank Chairman Ben Bernanke to create fear and uncertainty in financial markets. Mr. Bernanke said the debt ceiling should not be used as a negotiating tactic, warning that even the possibility of the United States not being able to pay its creditors could create panic in the debt markets. 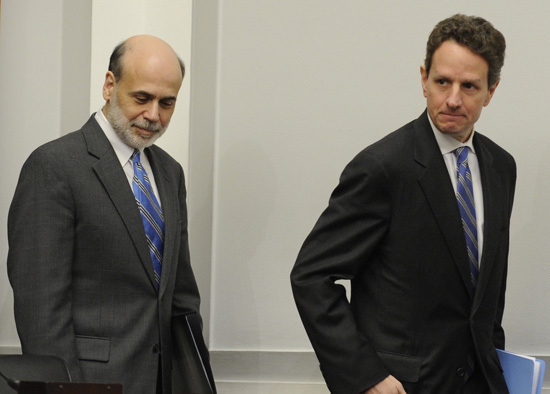 There are two problems with these statements from Geithner and Bernanke. First, it is a bit troubling that the Treasury Secretary and Fed Chairman are major players in a political battle. The Treasury Secretary, like the Attorney General, traditionally is supposed to be one of the more serious and non-political people in a President’s cabinet. And the Fed Chairman is supposed to be completely independent, yet Bernanke is becoming a mouthpiece for Obama’s fiscal policy. But let’s set aside this first concern and focus on the second problem, which is whether Geithner and Bernanke are being honest. Simply stated, does a failure to raise the debt limit mean default? According to a wide range of expert opinion, the answer is no. Donald Marron, head of the Urban-Brookings Tax Policy Center and former Director of the Congressional Budget Office, explained what actually would happen in an article for CNN Money. Our monthly bills average about $300 billion, while revenues are about $180 billion. If we hit the debt limit, the federal government would be able to pay only 60 cents of every dollar it should be paying. But even that does not mean that we will default on the public debt. Geithner would then choose which creditors to pay promptly and which to defer. …Geithner would undoubtedly keep making payments on the public debt, rolling over the outstanding principal and paying interest. Interest payments are relatively small, averaging about $20 billion per month, and paying them on time is essential to America’s enviable position in world capital markets. And here is the analysis of Stan Collender, one of Washington’s elder statesman on budget issues (and definitely not a small-government conservative). There is so much misinformation and grossly misleading talk about what will happen if the federal debt ceiling isn’t increased that, before any more unnecessary bloodcurdling language is used that increases everyone’s anxiety, it’s worth taking a few steps back from the edge. …if a standoff on raising the debt ceiling lasts for a significant amount of time, the alternatives to borrowing eventually may not be enough to provide the government with the cash it needs to meet its obligations. Even at that point, however, a default wouldn’t be automatic because payments to existing bondholders could be made the priority while payments to others could be delayed for months. The Economist magazine also is nonplussed by the demagoguery coming from Washington. Tim Geithner, the treasury secretary, sent Congress a letter on January 6th describing in gory detail the “catastrophic economic consequences” such an event would entail. …Even with no increase in the ceiling, the Treasury can easily service its existing debt; it is free to roll over maturing issues, and tax revenue covers monthly interest payments by a large multiple. But in that case it would have to postpone paying something else: tax refunds, Medicare or Medicaid payments, civil-service salaries, or Social Security (pensions) cheques. There are countless other experts I could cite, but you get the point. The United States does not default if the debt limit remains at $14.3 trillion. The only exception to that statement is that default is possible if the Treasury Secretary makes a deliberate (and highly political) decision to not pay bondholders. And while Geithner obviously is willing to play politics, even he would be unlikely to take this step since it is generally believed that the Treasury Secretary may be personally liable if there is a default. The purpose of this post is not to argue that the debt limit should never be raised. That would require an instant 40 percent reduction in the size of government. And while that may be music to my ears (and some people are making that argument), I have zero faith that politicians would let that happen. Instead, my goal is to help fiscal conservatives understand that Geithner and Bernanke are being dishonest and that they should not be afraid to hold firm in their demands for real reform in exchange for a debt limit increase. Last but not least, with all this talk about the debt limit, it’s worth reminding everyone that deficits and debt are merely symptoms of too much government spending. As this video explains, spending is the disease and debt is merely one of the symptoms. President Obama didn’t offer a budget plan yesterday. The White House hasn’t released anything beyond a set of talking points. But that’s not terribly surprising since his speech was really the opening salvo of his 2012 reelection fight. And it’s clear that a central theme of his campaign will be class warfare. The Ryan plan, by contrast, is the moderately right-wing mirror image of the Fiscal Commission. But rather than cementing in place bigger government, as proposed by Simpson and Bowles, Ryan’s budget slowly shrinks the fiscal burden of government. As such, it is on the “Liberty” side of the continuum. America’s Founding Fathers had the right idea, of course, They envisioned a very limited central government, and for much of our nation’s history, the federal budget consumed about 3 percent of GDP. Unfortunately, the Hoover-Roosevelt policies began the process of moving America in the wrong direction, and federal spending now consumes nearly one-fourth of America’s economic output. In other words, Obama wants to use his control of the purse strings to give bureaucrats more ability to decide what kind of care seniors can receive. It’s politically incorrect to call this type of entity a “death panel,” so I’ll simply contrast Obama’s top-down bureaucratic approach with the Ryan plan, which is based on giving vouchers to future seniors so they can pick the health plans that best fit their needs (people over 55 would be stuck with the current system). And since this is very similar to the system used to provide health care for Members of Congress and their staff, you know it must work reasonably well. Let’s briefly return to the tax side of the fiscal equation. I’ll have more to say about this in a separate post giving a behind-the-scenes look at what Democrats really hope to achieve in the area of tax policy, but I want to offer a basic explanation of why the soak-the-rich approach is doomed to fail. There are five reasons in this video to reject class warfare, including a very important warning that high tax rates on the rich almost always are a tactical move to facilitate higher taxes for the rest of us. Some people thought I was being unfair when I referred to the budget deal as a kiss-your-sister agreement. But as more information is revealed, it looks like the GOP got the short end of the stick – largely because they were afraid of a government shutdown (even though I explained Republicans actually did very well during and following the 1995 fight with Clinton). There’s realism and then there’s cynicism. This deal — oversold and dependent on classic Washington budget trickery — comes too close to the latter. John Boehner has repeatedly said he’s going to reject “business as usual,” but that’s what he’s offered his caucus. It’s one thing for Tea Party Republicans to vote for a cut that falls short of what they’d get if the controlled all of Washington; it’s another thing for them, after making so much of bringing transparency and honesty to the Beltway, to vote for a deal sold partly on false pretenses. …a new Congressional Budget Office report showing that the deal that purported to slash spending by $38.5 billion for the remainder of the year, really only reduces outlays by a fraction of that amount, and only cuts this year’s deficit by a mere $352 million. If the $38.5 billion was chump change in the context of $14 trillion debt, I wouldn’t even know what to call $352 million. Bread crumbs, maybe? The moral of the story is that Republicans need to make a fundamental decision. Are they serious about protecting taxpayers and America, or are they in the business of blowing smoke while getting a cut of the corruption in Washington? I explained yesterday that GOPers in Washington are governed by noble and base impulses. The budget deal was an example where the devil on one shoulder had more influence than the angel on the other shoulder.